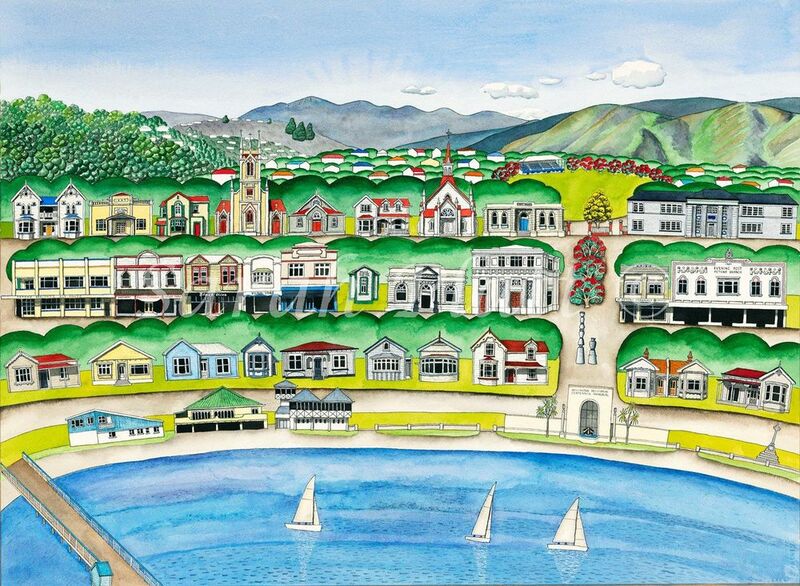 Couldn’t help but have a deep awareness of our colonial history as I photographed the Petone streets and beach. I loved the wee settlers houses built so very close together on tiny plots, the beautiful ornate wooden church’s and old church buildings, and the quaint shop fronts, with modern signage but relatively unchanged. A lack of money has spared Petone from having this delightful history bulldozed to make room for new development, so it’s now got that charming boutique feel developing down the main street. I was intrigued by the steady stream of people gathering to collect pure water at the Petone artesian well. The prints of this image are limited to 120 all individually numbered. The small and large print is printed havey white paper and the large on textured bright white photo paper with fade resistant inks. The canvasses are stretched over a frame and are printed on heavy textured synthetic linen with genuine lucea cannon inks guaranteed fade resistant for 70 years. For an extra $150 these canvasses can have a black or a white mounting frame around them.